Fur, so long associated with glamour and luxury, has lost its lustre. Over the course of the past year, many of the world’s most prestigious fashion houses have announced plans, in domino fashion, to stop using the controversial material in their collections. First up was Michael Kors, which announced at the very end of 2017 that it would phase out the use of fur in its collections (and those of its company Jimmy Choo) by the end of December 2018. Then, in March, Donatella Versace told The Economist’s 1843 magazine that her family’s luxury fashion label would no longer use real furs, with DKNY, Donna Karan and Furla following suit later that month. So what will replace fur, and the cozy, luxurious aesthetic it invoked? Luckily for conscientious fashionistas, faking it has never been so stylish. As multiple fashion heavyweights have proven over the past few seasons, faux fur is having a serious fashion moment; this fall, high street staple Topshop released a line of vegan-friendly, faux fur coats and accessories, while H&M’s recent Moschino collaboration featured a hot pink faux fur jacket. Vegan brand Unreal Fur has been doing a roaring trade in high-end fake furs since 2011. And shoppers are responding; according to the 2018 eBay Shopping Report, 50,000 faux fur items were sold on the site between July and September — marking a 105% increase in just 90 days. 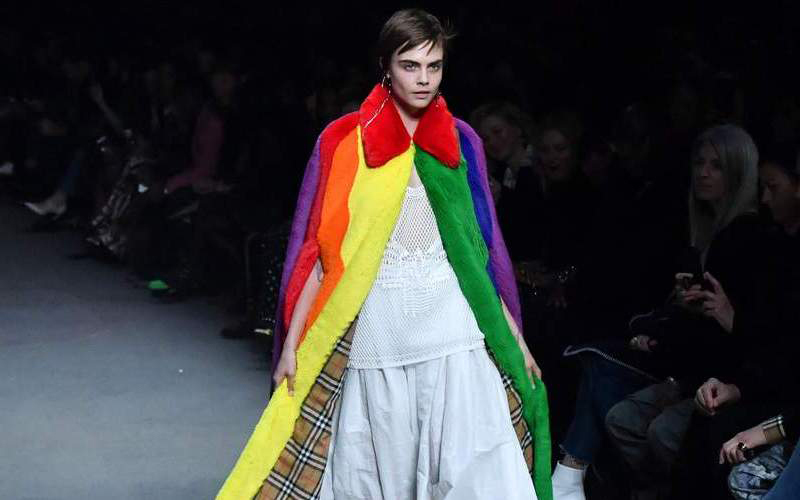 The change in attitudes could also be in part due to the number of celebrities adopting the trend, too — Bella Hadid, for example, has been spotted in faux fur pieces by the fur-free label Marei 1998, and Cara Delevingne’s modelling of Burberry’s faux fur rainbow cape back in Autumn has become one of the brand’s most iconic catwalk moments. Victoria Beckham recently caused a stir after being spotted in her own ‘Split Sleeve Fitted Coat’ in faux leopard print fur, while Alexa Chung is a fan of the faux fur label Shrimps. The message couldn’t be clearer: fur has fallen out of fashion — and it looks like it might be for good.